I'm really lucky. I have a lovely, functional, and spacious home studio. Back in 2013, my very handy husband, set out to turn two basement bedrooms into a dreamy art studio. See the early renovation snaps HERE and the studio in it's final finished form for HERE. After 3.5 years of heavy use, I thought it would be fun to again photograph my studio, to see how things have held up, and how I'm currently using the space. 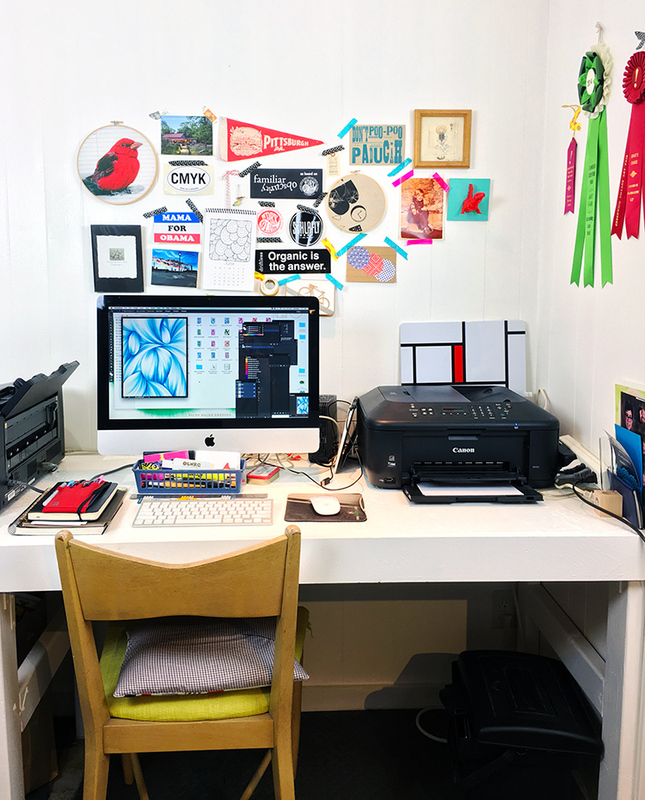 At the entrance of my studio is a vast island workspace. The big island is the best. 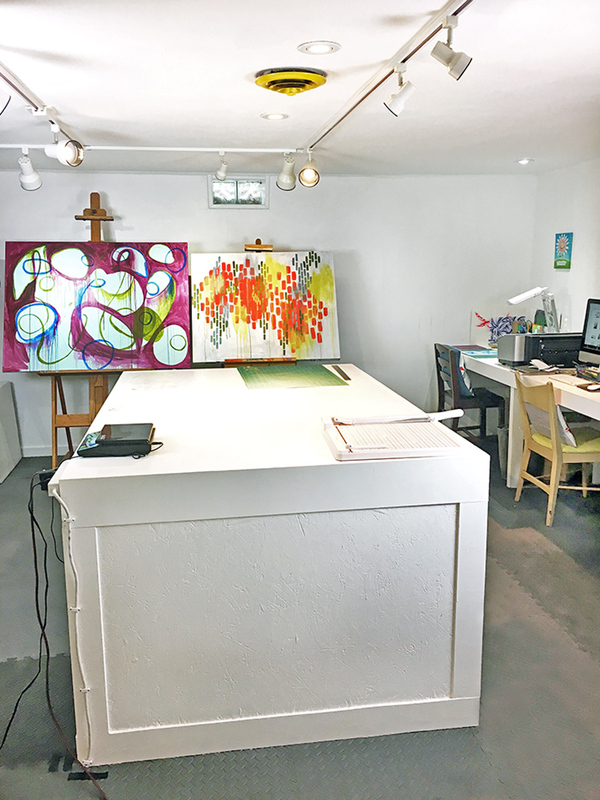 As you walk into the studio, you are greeted by a 4ft x 6ft island workspace. It's a big, stand-up desk, and I love it! It hardly ever looks this clean...It's usually a dumping ground of stuff. I spent a couple of hours cleaning everything up for these pictures, and I'm trying hard to keep it in it's current pristine space. It's so much more fun to be in here when it's all picked up and pretty. The island has open storage and flat file type drawers. The drawers are a little worse for wear, but still functional. The island has some great built in storage, that's been heavily utilized. My flat file drawers are a little worse for the wear (notice a new bottom drawer and one with a missing face.) I keep all of my most necessary and most used materials on this side of the island, as it's closest to my computer and drawing table. Attaching the power strip to the island was a brilliant Matt move. It gets used all of the time. Attaching the power strip to the island was a brilliant Matt move. It gets used all of the time, especially when I'm charging a dozen iPads for work. Over the years, I've decorated the space with interesting things I've collected. As I spend so much time here, I like to have things to look at as I work. Eventually, I'll fill all the space in on that back wall. My newest acquisition on the wall is this tiny watercolor that my great grandmother made for my grandmother on her birthday in 1952. My newest acquisition on the wall is a tiny watercolor that my great grandmother made for my paternal grandmother on her birthday in 1952. I never met my great-grandmother (she passed long before I was born) and I had no idea she made art. Such a treasure! I used to do the majority of my drawing here. Now it's mainly a storage area for my stupid huge pen collection. I used to spend a lot of my drawing time right here. Honestly, I do most of my drawing upstairs on the couch now, so this spot doesn't get much use. It's just been a storage area for my ridiculously large collection of pens that are tucked away in the bags, boxes and tubes seen here. I used to be a painter. It was my first real art love. Now, I'm too impatient for it. Maybe someday I'll go back to it. Matt and I both used to paint and as seen here, we each have our own easels. The paintings here are both mine, and were done about two summers ago, when I got the itch to paint again. It didn't last long, and they've been sitting there with my dried out palette ever since. Maybe, I'll go back to it again someday. Maybe. The back half of the studio is used for storage. There is open storage for packing supplies, inventory and odds and ends that I like to have quick access to. There's also a lot of old paintings of both mine and Matt's. (His are the huge ones!) In the far back corner of the studio, we have a wall full of storage closets. Not pictured: the mess of stuff that these closets hide! I have a thing for chairs. Even broken ones I guess. I can't seem to get rid of these. They're both broken and honestly, I don't know why they're still sitting here. I just can't seem to part with them yet. Studio mascot that both frightens and delights. I have no idea where this lil' devil came from. Matt hung it up on the peg board when we were setting up the studio, and it's been hanging there ever since. 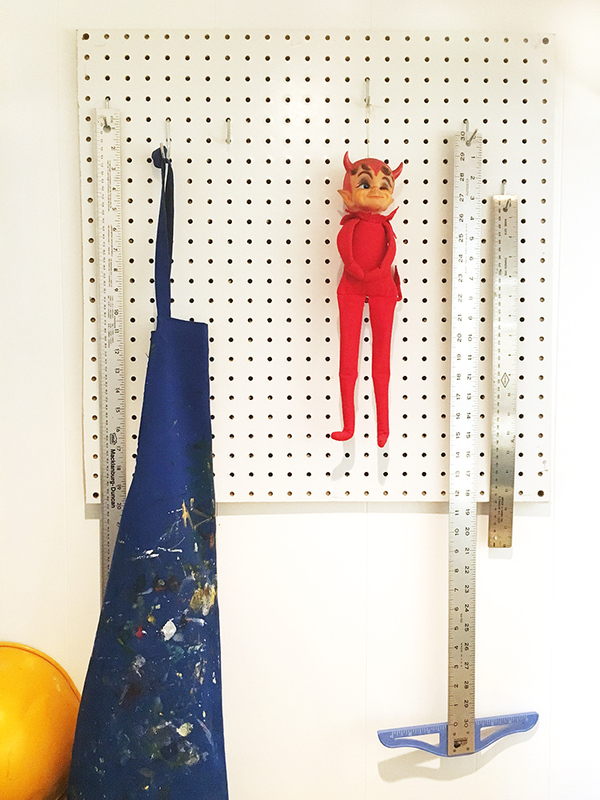 A young visitor to our studio told me that this looked like a devilish version of the "Elf on the Shelf." Kid art wall of fame. When the young ones in my life make me art work, I've taken to hanging it on the wall here. Interlocking foam tile flooring is an inexpensive and comfortable solution for a studio floor. The interlocking foam tile flooring has held up like a champ and is very comfy to stand on. It was a perfect, thrifty solution for our basement studio. A collection of things that I've somewhat artfully arranged in my studio. I've been slowly building this eclectic vignette over time. Some things, like the The "scandi" style prints, old metal cabinet and scissors I've picked up at yard sales and antique stores. The circus print is Matt's and badly needs to be framed. The owl key hook came from my maternal grandma's house, and the kokopelli pin was my paternal grandmothers. (Both of my grandmas passed last summer at ages 89 and 94. I've got some serious longevity genes folks!) It feels nice to have these little reminders of my beloved grannies nearby. I hope you've enjoyed this glimpse into my happy place. Until next time. We Bought a Fixer: Studio Renovation Complete! We're finally ready to unveil our fully renovated studio space. 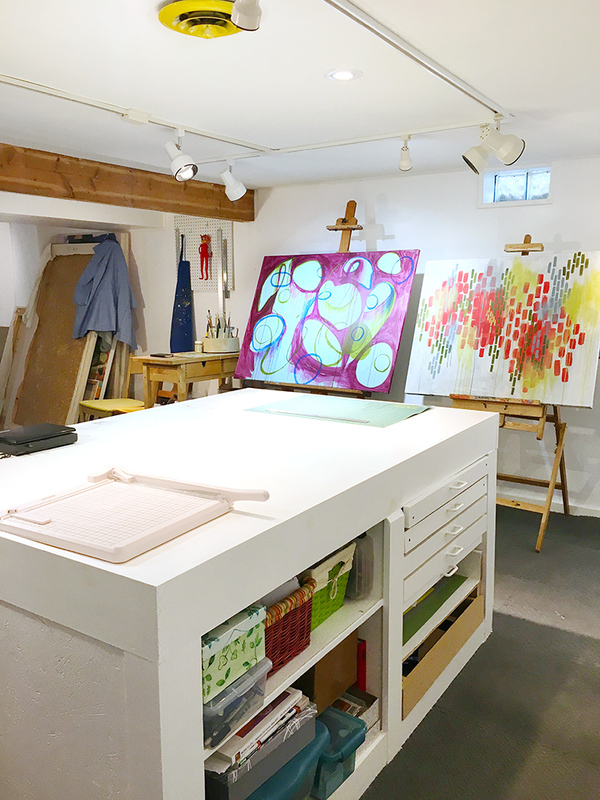 We were able to turn a tired, water damaged basement den into a large, bright and super functional artist studio. I have to admit, it's pretty freaking cool!! Click HERE to see the early stages of the studio renovation. Next, we gave all of the built-ins a coat of paint. Ta-da! White paint is magical! Last weekend, we did final touch-ups and started moving stuff in. This is my realm. I've got a nice space for drawing and computing. This is Matt's pad. He really can't wait to paint again! 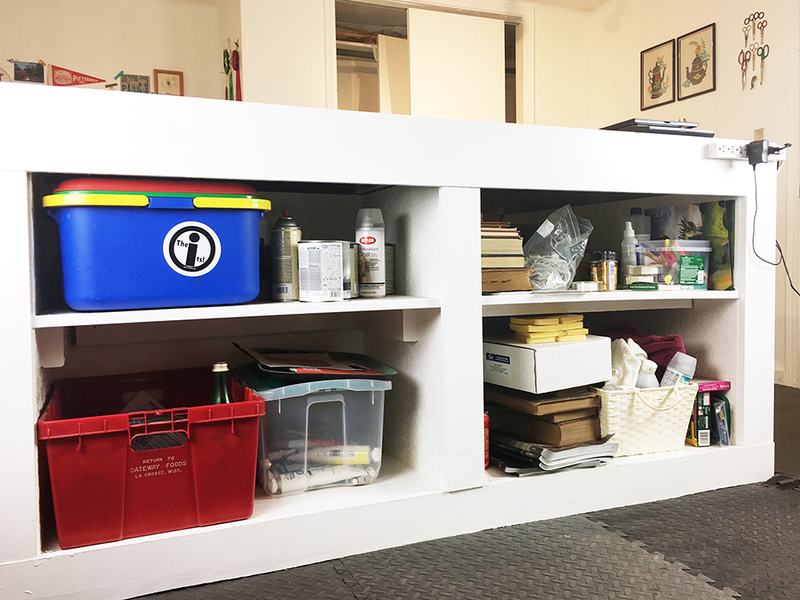 The massive work table measures 4' x 6' and has storage galore. I like that this table was built to stand up at and I can really spread out on in it. ....And the closed storage along the back wall, we're set! 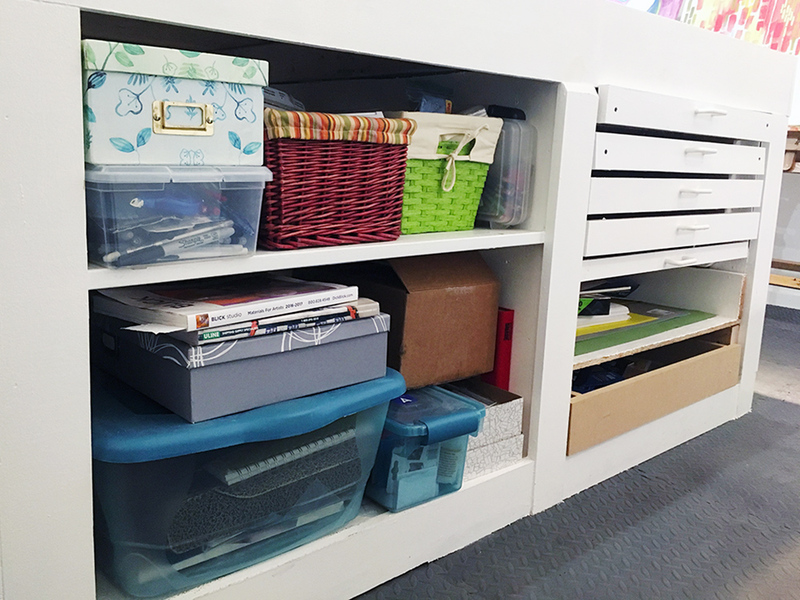 We even organized it all to make the most of the storage space. I've already got a couple of new pieces going in the new space. Stay tuned! 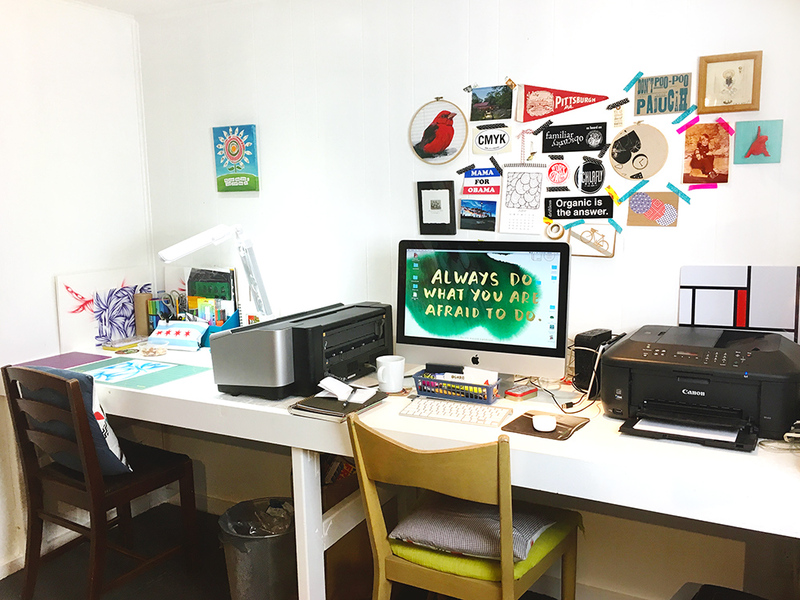 I can't believe we have such an awesome studio space, in our house! I really have to give most of the credit for this amazing transformation to Matt. He is super talented and so motivated when it comes to home renovation. I'm a lucky girl. What fun we will have here! Have a great week friends. Ta-Ta! As long time readers know, we bought a fixer-upper home in December of 2012. We've renovated the entire main floor and now have moved on to our basement. if you'd like to be included. Thanks!